Now these are trade winds! After weeks of light synoptic flow, sea breezes, thermals and overdevelopment, we are back to a more typical pattern of moderate easterly wind. At least for a few days. 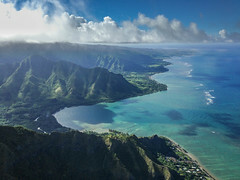 Pilots flocked to Kahana and Makapuu to enjoy the easy ridge lift, and also some fun and challenging technical cross country flying. Technical flying is the kind that involves being low and near terrain, as opposed to the kind that involves thermaling to cloud base in wide open air. Oahu pilots could write the textbook on technical flying. It was great to welcome Mad Dog back to the skies above Kahana, after a month away in Europe. Woody, Thom, Jeff, and Marc joined in as well. Matt and Anne stirred up the air around the beach, and James and Harvey made appearances in the landing zone at the end of the day. Crossing the bay was quite difficult because of the brisk easterly flow. Thom bravely tried first, but he pushed too deep too low, eventually limping back around below the Crouching Lion knob with barely enough altitude to make it back to the beach. I was just starting to cross when he came back, and he warned us over the radio that Hidden Valley in Kaaawa was NOT working. I continued my line anyway, figuring I’d try my luck, but I planned to heed the warning and not get too low or deep. When I pulled in to Hidden Valley it was definitely very east and not working well at all, but I had enough height to stay put and try to figure out how to climb out of there. It took forever, but slowly I began to claw my way up. Meanwhile Mad Dog crossed over and ended up fighting the easterly flow in the grovel pit over Crouching Lion. After trying to punch through on a couple of different lines, he turned back with just enough altitude to climb back up at Kahana and try again. On his next attempt he found himself in a situation similar to Thom’s, a bit low to find anything in Hidden Valley. He opted to land at Swanzys rather than retreat to Kahana. Jeff tried a crossing or two as well, and had an amazing cloud situation to help him across at one point, but at the end the easterly flow just shut him down, and he returned with enough to stay in the game back at Kahana. Meanwhile Thom manfully hiked back up for more, with one more bay crossing attempt in his quiver, but to no avail. I was on my way back from Kualoa when he turned around, and we both tanked up at Kahana for one last time. This time the plan was to head to Punaluu. The clouds were getting lower but it didn’t look too bad over there. Thom said it was carpeted with clouds, but in my mind it was just a few area rugs. But boy was I wrong. As we slid back along the Punaluu ridge to climb up in the back, we could see a huge low black bottomed cloud wall closing in from offshore. We thought we had enough time to cross back to Kahana, but we barely managed to squeak across Punaluu Valley as the raindrops started to tickle our wings. We scraped around the front of Kahana super low, but thankfully it was just enough. Whew! We landed and enjoyed some cold beverages, courtesy of Thom, while debriefing the day’s adventures. Meanwhile Woody and Marc hiked up for the sunset session as the wind started to fill in fairly strong straight onshore. Marc scored his first soaring flight, and due to a radio malfunction, he ended up being the sole pilot in command for the whole flight. And what a good flight it was! It was a gorgeous day out there. I could hear some guys on the radio at Makapuu: Doug and TommyRD, maybe? If anyone else has details or pictures to share, please post a comment! I was not sure I would even make the beach but squeaked it in. I packed up and headed up the trail for round two. My legs are sore this morning. Thanks for the update will see if I got any pics that were note worthy and forward them to ya. I could hear you guys on the radio from Kahana, notably Thom worried about clouds. When I was flying it was Shawn, Chandler and me. Careful flying the Icepeak in the rain, Jorge has a great story from last week, but you will have to ask him. That story is already legend!